Lock in a great price for Saint Moritz Hplus Express – rated 8.7 by recent guests! - I have to say that the staff are all very nice and accommodating and seem to be happy to help when asked. Great view from the roof during breakfast! 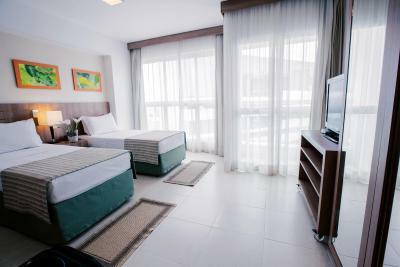 Very good location, right beside a big mall. The view from the roof during breakfast was amazing! 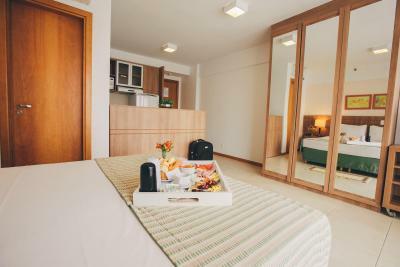 Very good value for money on the weekends at about R$170/night. Expensive during the week, like all hotels in Brasilia. The gym is well equipped for a hotel. And it was well used, meaning others like it as well. Very good breakfast. Comfortable, good sized room. 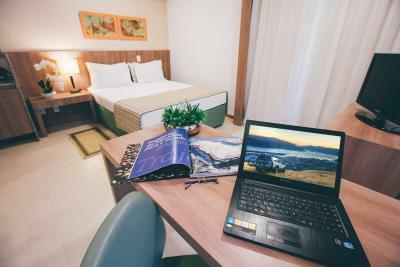 The staff was extremely helpful, all of those spoke very good English (which was not common other places I've stayed), the hotel itself was great too, especially the rooftop swimming pool. Nice view on the toproof, sauna and gym. Very quiet and clean. Simple, but very confortable. The location and the staffs are very good!!!! 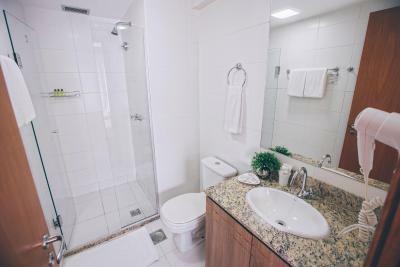 Very nice apartment and very clean. 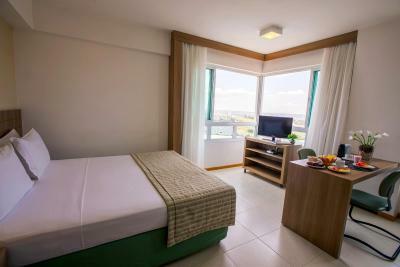 Good for a family stay and the roof top has an amazing view of Brasilia. Great location. Staff were very helpful. Spoke English well. Breakfast was nice. 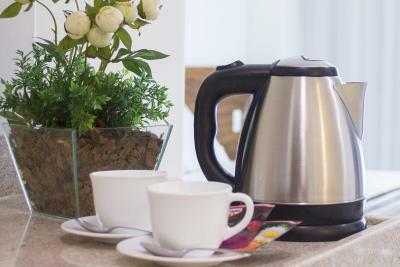 Saint Moritz Hplus Express This rating is a reflection of how the property compares to the industry standard when it comes to price, facilities and services available. It's based on a self-evaluation by the property. Use this rating to help choose your stay! 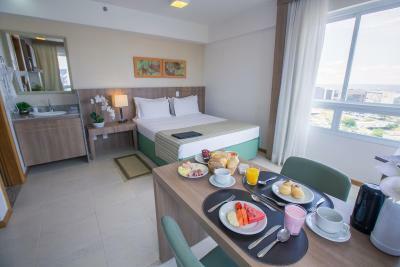 One of our top picks in Brasília.Ideally located in the heart of Brasília, Saint Moritz Hplus Express Hotel is just a 10-minute walk from Esplanada dos Ministérios and features a rooftop pool and a fitness center, as well as free WiFi, free parking and convenient express check-in/check-out. 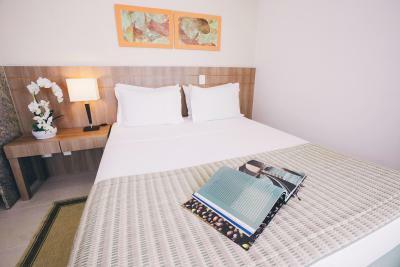 Express Hotel Saint Moritz Hplus offers double rooms with air-conditioning, a flat-screen TV and a kitchenette. They contain light wood décor, floor-to-ceiling windows and a private bathroom. 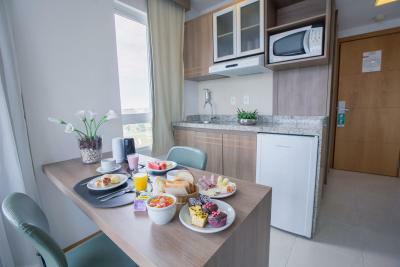 A microwave and dining area are also provided. 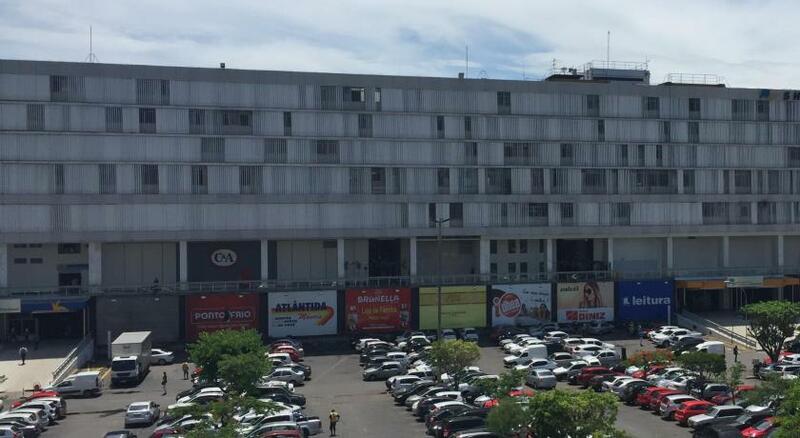 Shops, restaurants and a cinema are located in the Conjunto Nacional Shopping Center, only 650 feet away. Juscelino Kubitschek International Airport lies 9.3 mi away. 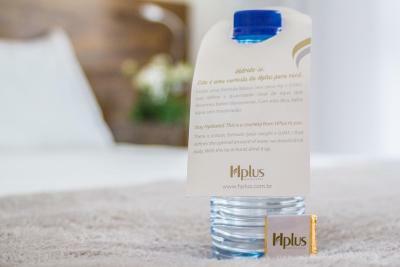 When would you like to stay at Saint Moritz Hplus Express? 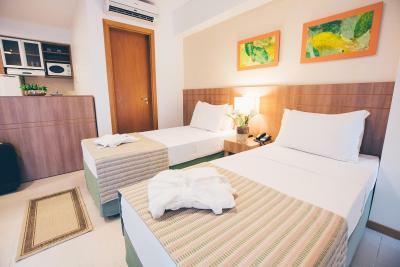 This air-conditioned room has an LCD TV, minibar and a kitchen with a microwave and utensils. 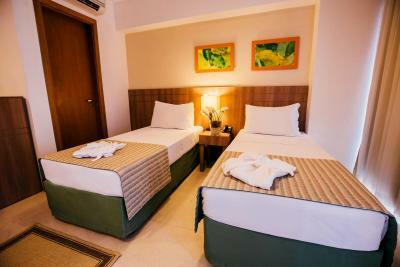 Please note that this room offers a double bed only. Twin beds are not available. 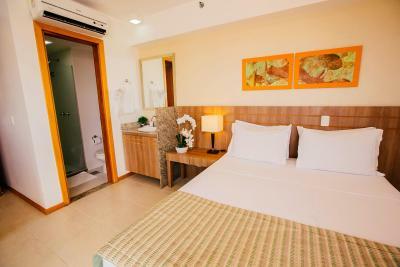 This air-conditioned room has a private bathroom, an LCD TV with cable channels and a safe. 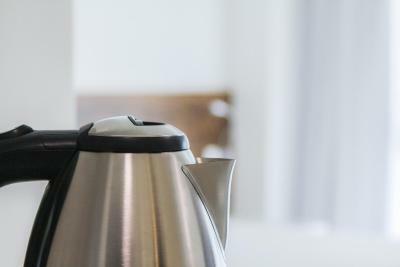 The kitchenette comes equipped with a microwave and kitchenware. Please note that this room offers 2 single beds only. House Rules Saint Moritz Hplus Express takes special requests – add in the next step! Saint Moritz Hplus Express accepts these cards and reserves the right to temporarily hold an amount prior to arrival. Please note, on Mondays the swimming pool at the rooftop is closed for maintenance. Incredible view from the rooftop terrace! 1) the TV is placed too low so one has to it up the watch TV. 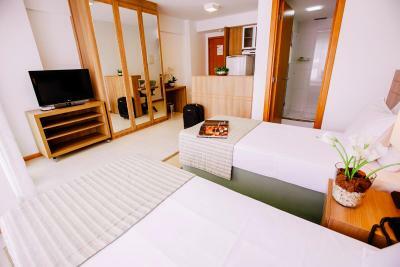 2) Bathroom is very compact (small) relative to the size of the suite. 3) Towels are thin and rough to the touch. 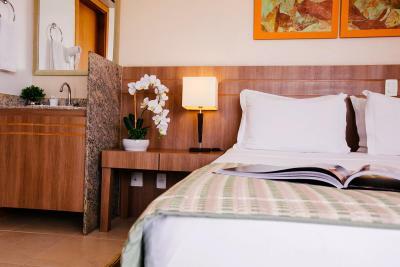 Great location, fast elevators, breakfast roon on the rooftop terrace with panoramic view of the city. There is a small gym with treadmills and weights. There is a Jacuzzi and Sauna but both were not working. Jacuzzi had no water in it indicating it has been functioning for a while. 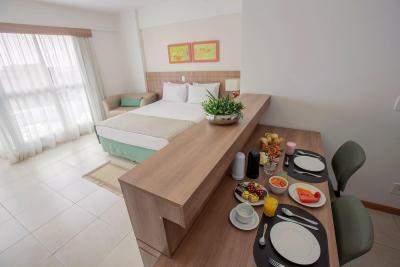 The room is actually a mini-suite with full size fridge, microwave, small sink, meal counter/workstation with 2 work chairs, which reduces the size of the sleeping area. Good sized closet with lots of hangers. An old unatrrative shopping mall is just across the street which, unusually does not have a decent grocery store selling beer and wine but has an adequate food court. A small grocery store is on the 3rd floor with limited items. The store is not sign-posted so you would not know unless you ask the on-site property management company. By the way the other two modern malls in the same sector also don't have grocery store, so you to buy beer and wine from the petrol station's shop on the other end of the north section. 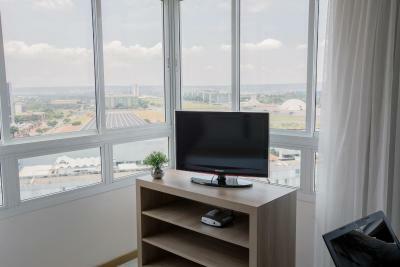 Great location to see Brasilia in a day. Some maintains issue like the side lamp switch was not in wall n broaken on the computer table there was no place to put charge for laptop.